Following on from the ASA Masters Hub’s exclusive interview with Masters world champion Diane Ford, we asked her to write a blog for us about the history of the European Masters Championships. Di has competed in an impressive 12 out of the 14 European Masters Championships held since the first event in 1987. We’re not sure if anyone else has competed as many – or more – times in the history of the European Masters Championships! So there are few people better qualified to give you the low down on what has happened in previous years, and what to expect at London 2016 this summer. European Masters Champs rookies, take heed! I have competed in nearly all the LEN European Masters Championships since the inaugural one in Blackpool in 1987. They have been held every two years since then and the only stagings in the history of the European Masters Championships that I have missed were Coventry in 1991 and Yalta in 2011. Numbers have grown incredibly fast – managing so many entries has become quite a challenge for the organisers! Now the date has slipped a year to be combined with the elite swimming to form the LEN Aquatics Championships and I am looking forward to London 2016. Host countries have made improvements over the years and numbers have grown incredibly fast, to the point where now managing so many entries has become quite a challenge for the organisers! In Blackpool, the venue was the old salt water Derby Baths on the promenade – now demolished – where many of us had fond memories of swimming in the National Championships as teenage competitors. 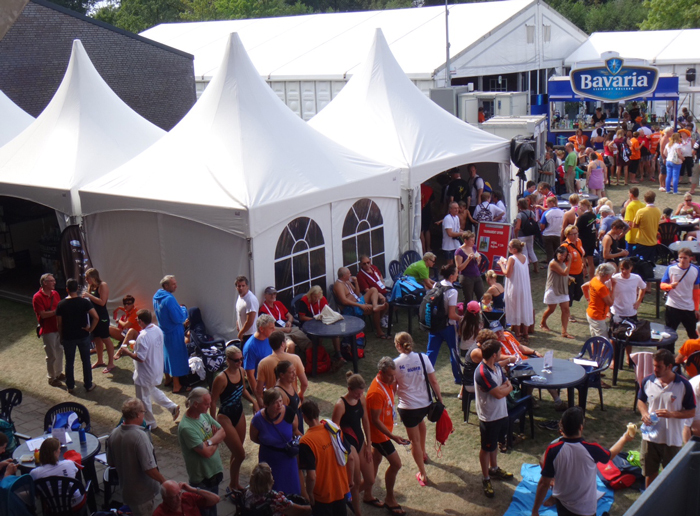 Many of the Championships have been held in outdoor pools and teams have set up tents or gazebos as a base on the grassy area around the pool which ensures a great team spirit and is also somewhere to leave bags as lockers at these events are always in short supply. However, the humid temperatures at the end of the summer have often resulted in thunderstorms, turning the areas surrounding the pool into mud baths to be squelched through to get to the marshalling point! Thunderstorms turned the areas surrounding the pool into mud baths to be squelched through to get to the marshalling point! Rain has featured in many of the other venues in the history of the European Masters Championships including Prague (1997), Innsbruck (1999) and Kranj (2007) but it did not deter swimmers or officials and everyone’s favourite official in the calling area, Andre Prayer, kept us amused and cheerful. The event is always a very crowded affair and facilities have varied from venue to venue. The host countries naturally have high entry numbers as swimmers who would not normally travel to events abroad are keen to compete at their home venue. Riccione struggled with limited facilities before the second indoor pool was built and a temporary pool was erected in Millau in 2003 for warm-ups and swim downs which worked well. Eindhoven had fantastic facilities with several other pools on the complex but the rest areas and poolside got very crowded. Registration can be a very slick procedure or can seem to take forever so competitors should ensure this is done at the earliest opportunity to allow access to the pool and changing facilities. Be prepared for busy warm-ups! If London 2016 is your first time at a major international competition, you be aware that warm-ups can be a nightmare at some venues! In Cadiz (2009), everyone shared a 25m four lane pool and, as is common on the Continent, there was no supervision and no ban on diving so it became quite dangerous. This will not be such a problem at London 2016 but it will definitely be very crowded so everyone needs to be careful. Also, the 50m sprint events will be fast and furious and the next heat has sometimes been started before the previous heat has finished to keep the programme on schedule! Good luck to all competitors, swim well and get some good results, but most of all – have fun!